The purpose of this post is to explain how Medicare calculates the operating and capital cost to charge ratios. 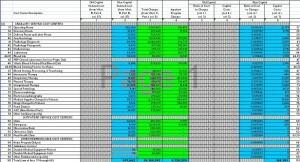 Which cost report is used to calculate the cost-to-charge ratios? Medicare informs that it is the latest settled or tentatively settled cost report that is used for calculating cost-to-charge ratios. How is the OPERATING cost-to-charge ratio calculated? This tells us that our operating costs, net of capital costs and pass-thru costs (medical education, non-physician anesthetists, etc.) total $6,180,220. Nursery costs are generally excluded (line 42). Second, we need to obtain the total charges. We can obtain this from D-4 on lines 25-30 and line 103 (2552-96) or the 2552-10 equivalent on D-3. We add lines 25-30 and line 103. This gives us $8,325,607 + $4,720,929 = $13,046,536. Third, we divide the costs in step 1 ($6,180,220) by step 2 ($13,046,536). This gives us approximately 47.4%. How is the CAPITAL cost-to-charge ratio calculated? 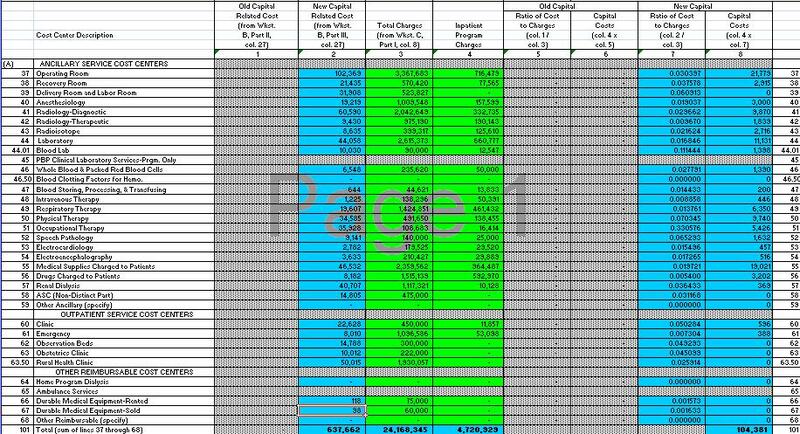 First , much like the calculation for the operating cost to charge ratios, we start with the D worksheets. In this, case we need to go back to the capital costs we eliminated from line 53 on D-1. Our first step is to obtain the routine and ancillary provider capital costs from D, Part I and D, Part II. From D, Part I we need to obtain the routine capital costs, the sums of line 25-30 or the 2552-10 equivalent. The sum here is $197,987. To this, we add line 101 from D, Part II or the 2552-10 equivalent. Line 101 totals $104,381. We now add the two amounts to get $302,368. Second , we obtain the total charges from D-4 (2552-96) or D-3 (2552-10) as we did for the operating cost-to-charge ratio from step #2 above. The total was $13,046,536. Third , We divide the totals from step 1 ($302,368) by step 2 ($13,046,536) to get 2.31%..